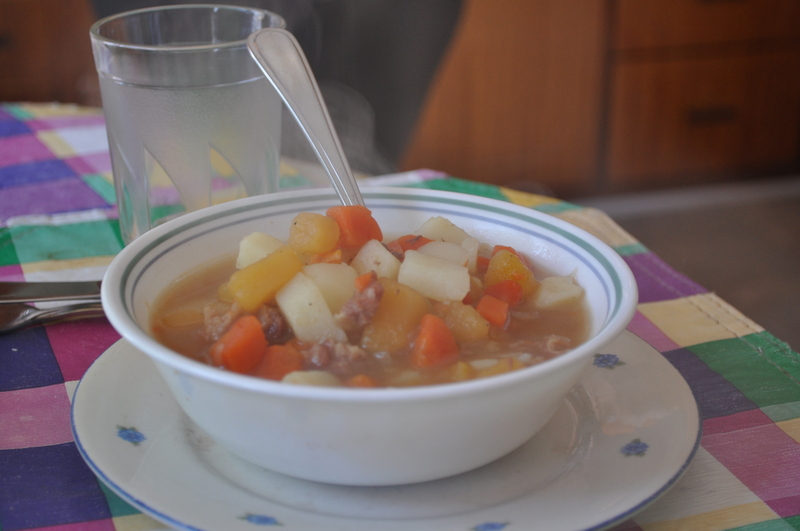 Newfoundland & Labrador has a traditional Sunday’s Dinner with some form of meat, potatoes, turnip, carrot, cabbage (greens when available), peas pudding, salt meat, puddings and gravy. 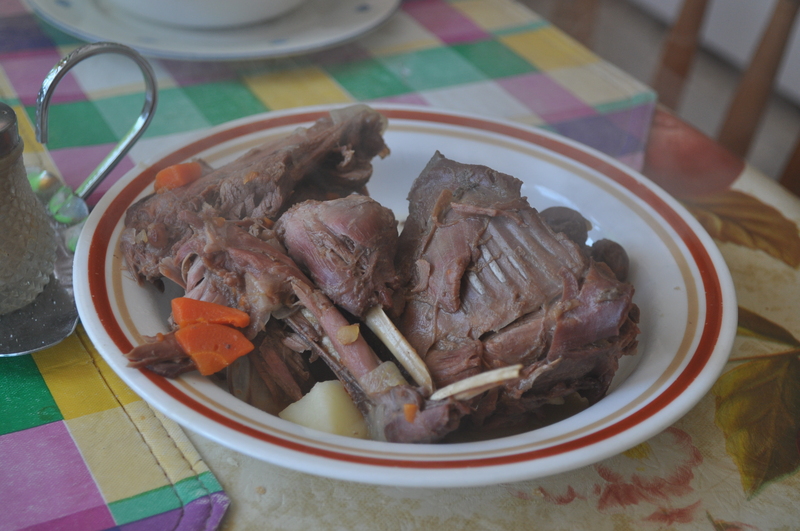 Sunday’s Dinner is a meal that us rural Newfoundlanders & Labradorians look forward to, especially if grandmother is cooking it. A near mornings work with many pots, pans and hands in the kitchen serves up a delicious meal. The rabbit was snared during last season. I look forward to getting a fresh one as this past weekend a light powder of snow fell on the Great Northern Peninsula. My father would spend a week or two after Christmas with his buddies in what we referred to as the rabbit camp, as it was located way inside the country. Each year, he always brought back a good bounty of rabbits for our family and his parents. I remember when I was younger, going in the woods with him to check his slips. He showed me how he set up the snares and how to increase your chances of catching a rabbit. I do not eat rabbit that often, and still today only enjoy the legs. So there will be no fighting for the head when I sit at your table, as is in most cases. One memory that comes to mind when I eat rabbit, is off my late Uncle Douglas. He spent many hours in the countryside, trapping, snaring and berry picking. He would always supply me with a rabbit, either bringing it to my house or I would be equally as happy to go to his small trailer to pick it up. He may have been hard to understand at times, despite at times calling me or others a “Frenchman”. I believe this was his ironic sense of humour and whenever he was around he was a mountain of local knowledge as he knew the daily catch of local fishers and other happenings in the community. He would always ask if I spotted a moose or caribou on my drive from work and listening attentively for the answer with details. Uncle Douglas was a gentle man, who loved children and gave freely of what he had to the benefit of others. I miss sharing those conversations with you, but still enjoy a feed of rabbit whenever I get the opportunity. I hope when traditional food is placed on your table, you can think of a memory, occasion or person that brings a smile to your face. A visit to my Grandmother from Nameless Cove after being in the cabin was quite the treat. A wonderful meal of wild rabbit, stuffing, peas, carrots, turnip and potatoes – all topped off with gravy. I enjoy this traditional meal as it brings back memories. As a young boy, I would go with my father to check his slips (or rabbit snares). We would go on his Yamaha Bravo! He had the skill to well place a slip, adding twigs or tree limbs to ensure the rabbit would have to hop through the hole. Sometimes we would take our snowshoes to prevent us from sinking too deep into the snow. My uncle Douglas, who has since passed. He would spend a significant amount of time in the woods, whether it would be trapping, rabbit catching or berry picking. I would be assured that there would be a rabbit or two for me each season. For me it is important to now learn the process of rabbit catching from my uncles who continue this tradition. I must learn these skills to pass on to future generations. As well learn how to skin a rabbit and prepare the meal. For me it is important to learn the ways of the land, that has enabled people to survive for thousands of years – well before the Vikings came more than 1,000 years ago to this Peninsula. The utilities company noted they would be doing some upgrades to the main power line, leaving local residents from Castor River to Eddies Cove without electricity until 11:00 AM. This delayed my traditional lunch at grandma’s house. Early in the morning, I lit a fire. The heat from locally cut wood, provided much warmth. I did some chores and brought out some light trash. I dropped in to visit my grandmother, who faithfully had the pot on the stove and noted she was cooking “Rabbit Soup”, but it would not be ready until about 1:30 PM. We chatted for a bit and she had also proudly showed me all her knitting. She certainly keeps quite busy. The table was prepared, with homemade bread, the salt & pepper shakers, the rabbit had been taken from the pot and soup ready to be poured into each bowl. The rabbit was delicious. My grandmother and I always have a good chat, whether it is about the hockey game, curling, gardening, weather or past times. I had told her I was looking at old photos earlier, some of which included my grandfather, father and of course my childhood.RabbitMany good memories. I enjoy traditional recipes of rural Newfoundland. My grandmother and I discussed how traditions are dying as far fewer people of the younger generations are cooking with wild game. Modernization and the convenience of pre-packaged food is having an impact on the dishes that have been served on Newfoundland tables for centuries. Cut salt beef into small pieces. Place in large saucepan and add 2 qts. cold water. Bring to a boil. Place salt beef, rabbit and remaining 3 ½ qts (cook 1 ½ hours). Add vegetables and browning. Cook 30 minutes. Each community has a character or iconic individual that is memorable or does something out of the extraordinary. For the Town of Hawke’s Bay on the Northern Peninsula that person is 90-year-old Great-Great Grandmother, Cecilia (“Celie”) Smith. Over a pot of rabbit stew today at dinner, the conversation between my great-aunt, great-uncle and grandmother turned to bear sightings. I had mentioned to my uncle that while on vacation travelling to Conche (the French Shore) I saw a small cub near roadside. Then travelling on the Trans Canada Highway later in the week I saw another black bear. I have lived in rural NL for nearly 20 years and have never seen a bear until this summer. This re-called a recent article in the Northern Pen, Western Star and Telegram newspapers with the title, “90-year old bags bear”. This is not the first bear for this spry woman. I recall back in 2007 watching an episode of CBC’s Land & Sea, which profiled her at 87 & 88 years of age having trapped at least two previously (Celie’s story can be viewed at: http://www.cbc.ca/landandsea/2009/04/celies-story.html). This woman built her own home, a home for her parents and others, provided maintenance and worked 32 years at the Maynard’s Motor Inn, worked as a fisherperson and logger. She still maintains a large garden, does woodwork and other daunting tasks that most people my age and younger wouldn’t tackle, yet at 90, she makes it look easy. She has a real love for the great outdoors, the forest (woods) and at her cabin, which she built. She enjoys rabbit snaring and does so on her own snowmobile, accompanied by her great-grandson. To me she is one pretty cool great-grandmother. Even today she continues to beaver trap with her son and continues to hold a bear hunting licence. I remember a book given to me by an elementary school teacher, called The Legend of Princess Sheila NaGeira, which I read 15 years ago. The book left an impression on me because I remember she lived to be 105 years old according to the Legend and that she lived by the philosophy that “it is better to wear out, than to rust out.” So let’s take a page out of Celie Smith’s book, get outside and enjoy rural living.